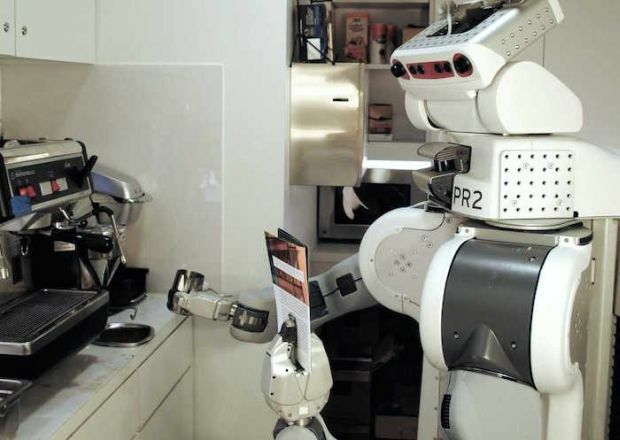 As humans rely on intuitive extrapolation skills while making the lattes, so does PR2. The machine has acquired learning from its prior experience and with the stored up database it extricates the process as per its requirements. This implies that even if PR2 has not explored all the parts of coffee maker before, yet it would be able to make coffee effortlessly first by ‘observing’ the external parts and then manipulating them. For instance, with an espresso machine, after identifying the object parts, it will look into its database for search query that has similar trajectories for operating the observed object parts. Accordingly, it will use that learning/operation over to the parts in real time. Suppose, in case of operating the hot water nozzle on the espresso machine, the machine might extricate its prior info that resembled the operation of urinal flush valve. It just has to look into its database and repeat the observed similar process, that’s all. Team lead by Prof. Ashutosh Saxena, have a grand vision with PR2. They have come up with an online learning tool based on crowd-sourced manipulation trajectories. In here, interested people including non-expert users can give in their inputs in terms of trajectories in a virtual environment, which is based on following simple natural language instructions. With an aim of making robots more independent, the team envisions to integrate this research with Cornell’s Robo Brain project. A massive storehouse of knowledge that has been gathered from the internet and stored in a bot-friendly format so that the robots may draw on as and when required. Future with robots looks promising where the machines would be doing exactly what we would want them to do irrespective of environment. A time, when we won’t be requiring any extra effort to train them.